What is B2B and B2C Writing? As a form of artistic communication, writing is like music: it encompasses hundreds of styles and genres. And though these styles may be different, they all share the same foundations. A tempo. A song structure. A melody. Writing is the same way. Its varieties seem very different, but when you break them down, they have a lot in common. This post will explain the difference between the two types of freelance writing gigs you’ll come across: Business to consumer (B2C) and business to business (B2B). It will help you understand how to approach each one to craft effective writing that impresses your clients. I’ll also cover those shared elements you need for both types. But first, you should know the broader business concepts of B2C and B2B. B2C companies, marketing, and ads target consumers (people), while B2B is aimed at businesses and organizations. Consumers (B2C) are buying things for personal use, either for themselves or family members. B2C transactions tend to be smaller in value and more commoditized, but happen more frequently. Examples include groceries, cosmetics, and clothing. Businesses (B2B) are buying things for use by the organization. These purchases tend to be larger, more customized, and slower than B2C. The goal of the transaction is to make the business run better, or help it increase revenue. Examples include cloud hosting, phone and internet service, and marketing – including freelance writing. As a freelancer, understanding the difference between B2C and B2B can mean more money and a larger pool of potential clients. You might get hired by a marketing agency that has multiple clients on retainer and needs you to write both B2C and B2B content. For B2C writing, you should use more emotion and make it feel more personal. Which purchase could be more influenced by emotions: a pair of shoes, or an IT management system? The answer is obvious. B2C buyers are much more susceptible to emotion than business buyers, who typically purchase by committee and have to answer to their superiors. That doesn’t mean consumer-targeted writing should manipulate people, or fool them into believing something that will never happen. But it does mean that writing for this audience allows you to appeal to your reader on a different level than you would in B2B. Successful B2C writers have a knack for employing proven psychological formulas to elicit emotion. One classic example is the Problem-Agitate-Solve (PAS) method. With PAS, a writer first presents a problem, agitates that problem, then presents the solution. You want to get paid to write, but you aren’t sure where to start. Worse, there’s so many competitors and low-quality gigs out there, it’s hard to cut through the noise to find well-paying writing opportunities. Contena provides both training on how to position your writing business to stand out, and direct access to a list of vetted writing gigs – updated daily. You’ll typically see consumer brands use emotions like fear, happiness, and security in all kinds of marketing, not just copywriting. In B2B writing, you must help your audience achieve a business goal. You need to provide readers with the information they need, in the format they want to consume it in, at the specific time they need it. It’s especially important in B2B writing to minimize fluff and hard sells. Buyers simply don’t have the time to deal with these elements, and many will be put off by them. Instead, focus on being relevant, valuable, and actionable in your B2B writing. Here’s a good rule of thumb for producing helpful B2B writing: would a reader gain value from reading this piece of content even if they don’t end up becoming a customer of the business publishing it? If so, the writer – and whoever created the assignment brief – has done a good job. These are just general guidelines, not hard-and-fast rules. Especially in today’s era of creative, brand-driven marketing, you’ll see sellers on both ends of the spectrum employing tactics from the other side. Plenty of B2B companies use emotion and direct calls to action in their writing, while tons of B2C brands focus on educating their prospects (Johnson & Johnson is a great example of the latter) and helping them achieve goals. That’s why you need to know and understand both styles! However, you should nail down the core concepts first, before trying to switch it up. 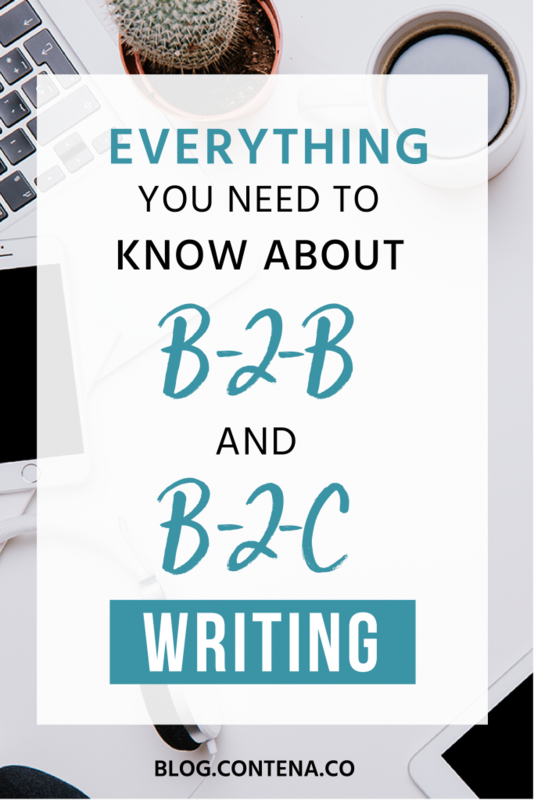 What’s the same in both B2C and B2B writing? An in-depth understanding of your buyer persona and the specific problems they are facing. You won’t be an effective writer without this understanding. B2C writers need this knowledge to compel their readers to take action by presenting a solution to their problems, whether that problem involves their health, status, or family. Without knowing what challenges prospective buyers are going through, they simply won’t be able to position the product or service they are selling as the answer. And B2B writers need to know their audience so they can provide the information they need to help them meet business goals. You also need to understand the B2B buying journey – how long will it take them to go from prospect to customer, and what steps are involved throughout that process? If you have an in-depth, comprehensive understanding of your target audience, you can succeed in both B2C and B2C writing. B2C marketing is faster, has fewer people, and hinges more on emotion. Writers speaking to consumers should be concise and focus on how their offering can create a better future for the customer. By drumming up happiness, relaxation, status, or even fear, writers can craft powerful, persuasive content. B2B marketing is slower, more complex, and involves more people. Thus, writers targeting businesses – or writing on behalf of clients that do – need to focus on educating and providing value with actionable tips. Avoid fluff and high-pressure selling. Above all, understand your buyer persona and their issues. Know that there are times when B2C writing will adopt B2B principles – like buying a car – and when B2B writing will apply B2C principles – such as on a landing page or contact form. Learn these differences, practice them in your writing and apply what you’ve learned on your next gig. Positive results will follow.